A group of students in Delano are taking on a lot more than just school work. They are acting as advocates to better their community by raising awareness to unknown issues and encouraging their young peers to get involved. These students are part of a group called LOUD for Tomorrow. LOUD for Tomorrow was established in 2018 by a research project called Central Valley Freedom Summer, which encourages young people to register to vote. Delano’s Center on Race, Poverty and Environment, which works to achieve environmental justice and healthy, sustainable communities through collective action and the law, also helped organize the youth-led group. 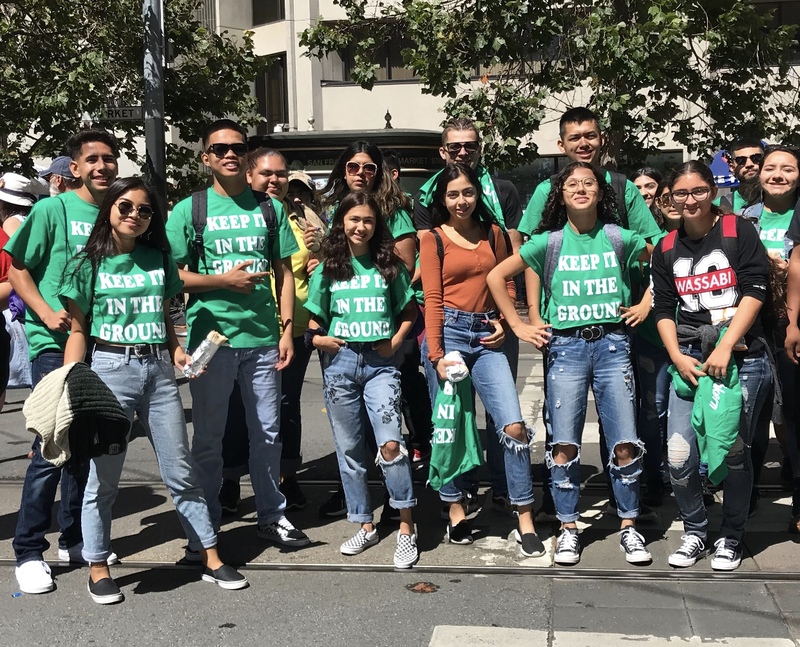 “Working with the middle and high schoolers from Loud for Tomorrow gives me hope for our future in the San Joaquin Valley, California and our country, said Valerie Gorospe, CRPE’s communications coordinator in the Delano office. The mission of LOUD for Tomorrow is to create a space where youth can share and execute ideas that can advocate for a better community through civic engagement. “There’s that popular saying that ‘youth are the future’ but what kind of leadership opportunities are we giving them to become the future,” asked Orellana. That is exactly what LOUD for Tomorrow is doing — providing students with leadership opportunities. LOUD for Tomorrow students set up a registration booth at a Delano High School Campus. 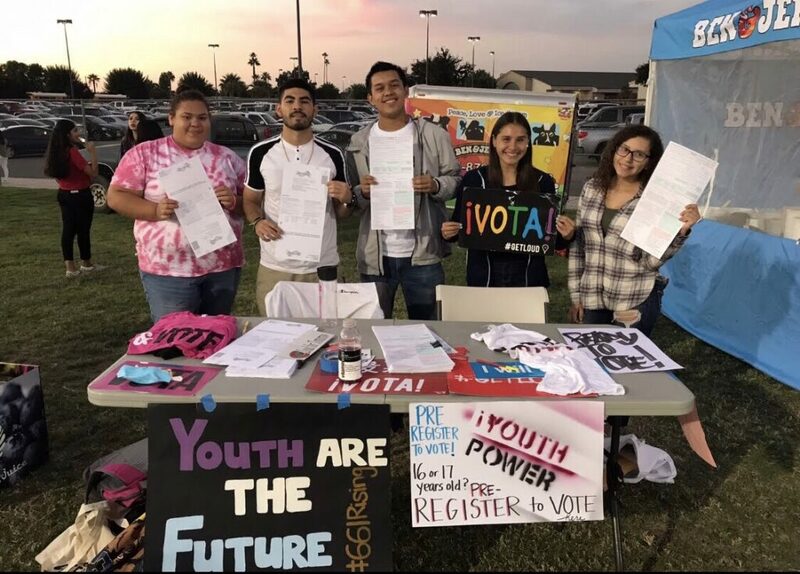 One of the group’s biggest projects is working with the Delano Joint Union High School District to encourage students to pre-register and register to vote. Young voters have one of the lowest turnout rates: just 16 percent of Californians aged 18-24 voted in the June 5 primary, according to UC Santa Cruz. In August of 2018, the Delano students attended a school board meeting and advocated in front of the trustees for voter outreach on three high school campuses in Delano. Immediately after, students got to work. They set up voter registration booths at football games, school lunches and community events and pre-registered 16- and 17-year-old students and registered those 18 and older. As a result, LOUD for Tomorrow registered and pre-registered more than 200 people. The students saw another big win when they advocated for Lytle Avenue, an unpaved residential road in Delano that lacks sidewalks and street lights. LOUD for Tomorrow called the Kern County Board of Supervisors and explained to the board the problems an unpaved and dark street presents to a community. “Although so many people in my community rely on Lytle Avenue, it’s broken and dangerous,” said Norma Ruiz, who lived on Lytle Avenue. LOUD for Tomorrow students attend a conference. School buses couldn’t drive down the dirt road, forcing students to walk more than a mile to the next bus stop. Some students have been harassed on the dark street while walking to and from school by inmates in the jail set back just off the road. And residents feared their homes would burn down because the fire department might not be able to find the unpaved street. As a result of the students’ hard work, the Kern County Board of Supervisors allocated $2.65 million to invest in the county’s parks and appointed a Lytle Avenue project manager who ensures the road gets paved.